In the last few decades however, most doctor's visits are made in an office or hospital setting so that few doctors use a black bag. But technology has added a new dimension to the traditional black bag - it has modified its contents made it more powerful. Basic drugs in the black bag have changed little in the last few decades but miniaturization of diagnostic equipment has made it possible to carry around various paraphernalia depending on the physician's specialty. In addition to the old standards such as a stethoscope, blood pressure cuffs, gauze and tape, digital thermometer, traditional ophthalmosope, and reflex hammer, physicians now throw in a laptop to which can be attached equipment for monitoring everything from heart to lung function, and to keep medical records. Other essentials are an iPad and iPhone to access x-rays and lab reports, and conduct internet searches for evidence-based guidelines. I might add also that a hand-held or pocket ultrasound machine is mandatory. And one very important item not to forget is . . . CHARGER! 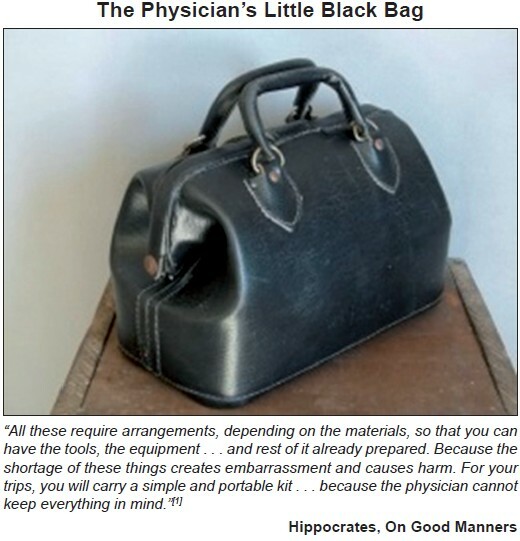 As technology develops and evolves, so too will the physician's black bag. Oates, J. Babylon. London: Thames and Hudson, 1986:183. Tsoukalas G, Kousoulis A. et al. The earliest mention of a black bag. Scand J Prim Health Care. 2011; 29:196-7.